Kathmandu, 23 September : Rastrakavi Madhav Prasad Ghimire turns 100 year old today. He was born in 1918 at Bahundanda of Pustun in Lamjung district. On the occasion, President Bidya Devi Bhandari has extended birthday wishes to Rastrakavi Ghimire on his 100th birth anniversary. President visited his residence at Lainchaur this morning. 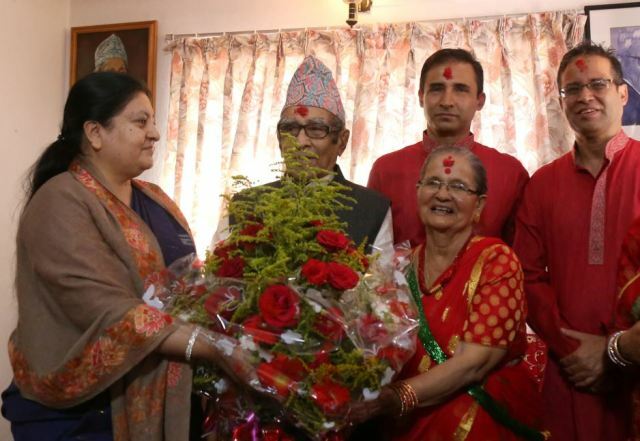 President Bhandari wished for good health, long life and creative life of the Rastrakavi. Rastrakavi Ghimire is best known for Gauri, Malati Mangale, Himal Pari Himal Wari, Aswathama, Rajheswari and Shakuntala.